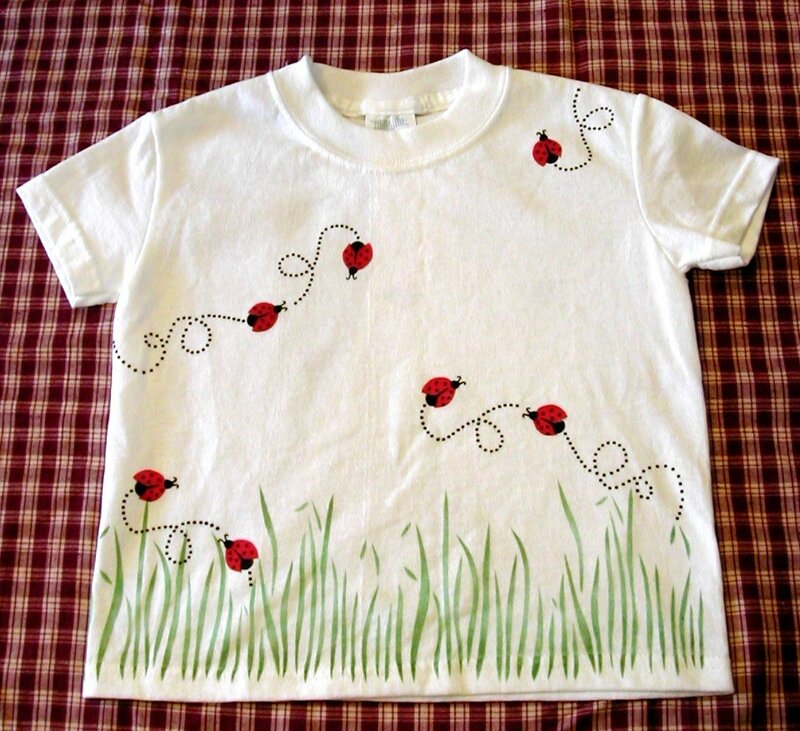 Decorate a simple child's t-shirt with our adorable Ladybug Dance stencil. 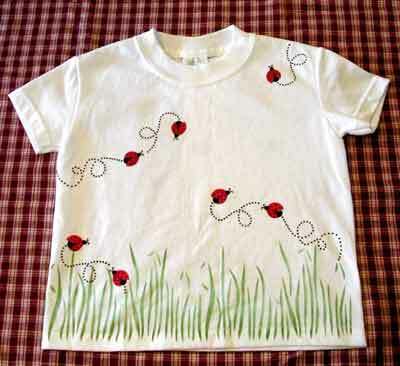 Your little one will have fun wearing this whimsical shirt. Have fun using your imagination! Prewash and dry the t-shirt. Do not use fabric softener. Put cardboard in between the layers of the t-shirt. Using SP8 Telemark Green and stencil SB11, stencil the grass along the bottom of the t-shirt front. Allow to dry. Repeat this procedure on the back of the t-shirt. Use SP6 Salem Green to add shading to the grass blades. This adds a bit more dimension to your grass. 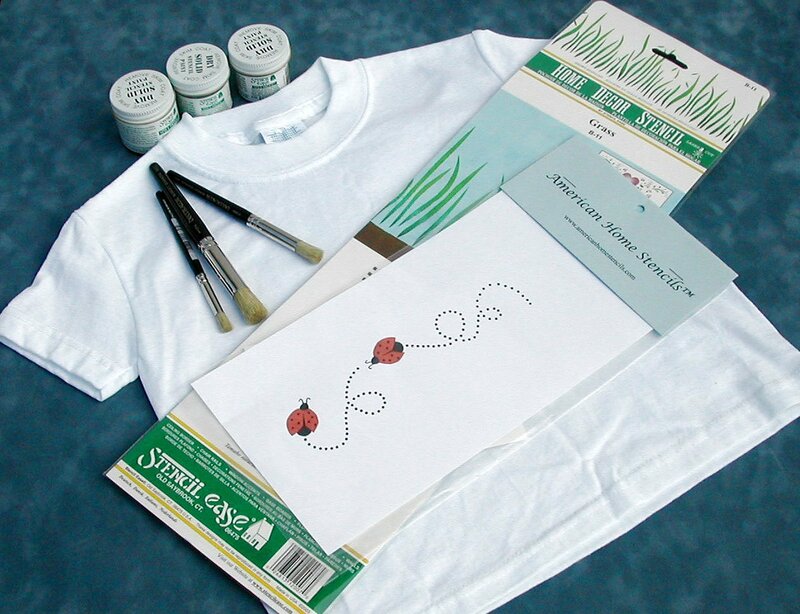 Apply the A971 Ladybug's Dance stencil in various desired locations on the t-shirt, allowing ample drying time between overlays. 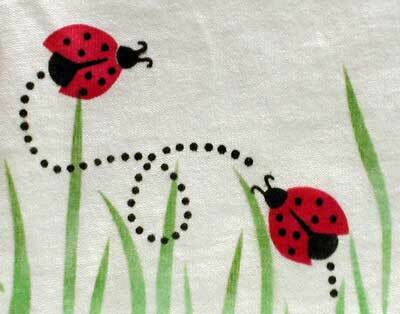 Wait 2 weeks to wash your shirt after stenciling with stencil cremes. We used a quilter's marking pen, with disappearing purple ink to mark the stencil registration marks on the shirt. This works great and disappears within 48 hours. Stencil cremes, if not heavily applied, take about 24 hours to dry to the touch and about 2 weeks to cure totally.